Anthrax is an acute infectious bacterial disease caused by the spore-forming bacterium Bacillus anthracis, primarily affecting cattle sheep goat etc., and is also capable of producing serious disease in human beings. Because anthrax is considered to be a potential agent for use in biological warfare, the Department of Defense has begun mandatory vaccination of all active duty military personnel who might be involved in conflict. Also, the current war against terrorism has raised concerns of biological warfare among rival nations. There have even been reports of recent outbreaks in the world. Rabies is caused by a virus which is present in the brain, salivary glands and saliva of the effected dogs. Therefore when a mad dog, fox, jackal bites the virus enters the wound through saliva. Sudden deaths with blood from natural orifices are characteristics out come of anthrax. Severe distension of carcass is also noticed. Cutaneous anthrax: Most common form of disease in man. A wound with no pain and pus with raised red borders called eschar is normally seen on the hands or other places on the body of the persons who handles anthrax cases or carcasses. Untreated cases may end up in death. Pulmonary anthrax: Lung form of anthrax may result from inhalation of anthrax spores while handling wool of animals died of anthrax, and amongst Carpet weavers and others exposed to the spores as in biological warfare or terrorism. It is characterized by cough, pain in the chest, high fever, septicemia, blood in the sputum. Untreated cases are fatal. Meningial anthrax: Some times the anthrax bacilli enters the central nervous system and produces severe head ache, nervous symptoms, high fever, general malaise and death. Cerebrospinal fluid shows typical anthrax bacilli and blood. Gastrointestinal Anthrax: This form of anthrax is seen in people eating the meat of animals containing anthrax spores, which are very resistant to heat. The symptoms develop after 1 to 7 days several abdominal pains, high fever, blood in stools may be seen in patients. A reddish brown sore that breaks open and forms a scab fever chills general discomfort, uneasiness, or ill feeling (malaise). Headache nausea & vomiting shortness of breath cough congestion of the nose and throat pneumonia chest pain joint stiffness joint pain Signs and tests Blood cultures positive for anthrax chest X-ray serologic test for anthrax spinal tap for CSF culture and analysis. Anthrax infection can occur in three forms: skin, inhalation, and gastrointestinal. B anthracis spores can live in the soil for many years, and humans can become infected with anthrax by handling products from infected animals or by inhaling anthrax spores from contaminated animal products. Anthrax spores could be introduced into the air or spread by someone who had access to it, among other less sinister possibilities. Eating undercooked meat from infected animals can also spread anthrax. 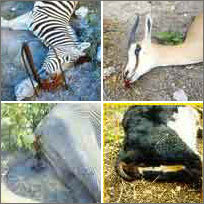 It is rare to find infected animals in the developed countries. Anthrax is diagnosed by isolating B. anthracis from the blood, skin lesions, or respiratory secretions or by measuring specific antibodies in the blood of persons with suspected cases. Once exposed to Anthrax half of all deaths occur within 24 to 48 hours. Doctors can prescribe effective antibiotics. To be effective, treatment should be initiated early. If left untreated the disease is fatal! This website has been developed to provide information pertaining to Anthrax that will help citizens develop plans to prepare for and respond to acts of bio-terrorism. The information within is intended for the citizens and includes details about the disease, recommended treatment, and specific issues relating to recognizing Anthrax in emergency departments. Anthrax infection is a disease acquired following contact with infected animals or contaminated animal products or following the intentional release of anthrax spores as a biological weapon.